MOCAP Square Head Flanged Plugs are designed for use on NPT threads and fittings. The Square Head design allows for easy installation. The Flange design protects the outside of the port, while the plugs keep ports protected during low-pressure testing and in-house processing or handling. These are not intended for permanent applications. Protects threaded components from moisture, dust and damage during production, shipping and storage, and can also be used as masking during painting and plating. 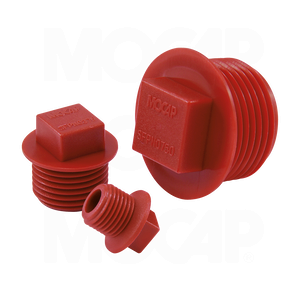 Our SFPN Series Threaded Plugs are moulded in Red polypropylene plastic and sized to fit NPT threads from 1/8-27 thru 3/4-14. Many Sizes of Our Square Head Flanged Plugs for NPT Threads are Stocked for Immediate Shipment.